Raghavan nair is a retired station master who returns back to his village to live the rest of his life happily with his wife and children. But he comes to know that his two sons prabhakaran and prakashan are jobless working for rival parties. Initially raghavan feels proud of his sons political ambitions later he suffers it's consequences leaving him broken. 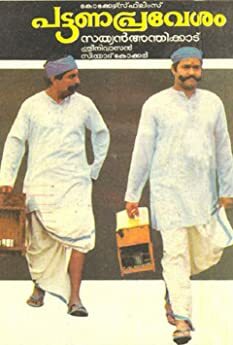 Thilakan, jayaram, sreenivasan, maamukoya, oduvil unnikrishnan, mala, shankaradi etc all gave superb performances but my favorite is siddique as the agriculture officer udayabhanu. Sandesham is a film I always enjoy watching. Prabhakaran: Don't ever speak about 'Poland'! I will not bear it any longer! Prakashan: Is Poland his heirloom? Prabhakaran: Don't even pronounce 'Poland'!